Before I break into a rant let me say I have been watching quite a bit of the Olympics and am pleased Canadians have do so well. I look forward to more doing well and even winning medals before the events are over. That out of the way, let me say all year I have been troubled by the official aggressive attitude being expressed by the offical Canadian Olympic establishment, "Own the Podium!". More and more we have heard that Canadian athetes are expected to win medals, perhaps, more than at any other Winter Olympics. We have had to put up with this mantra of only winning being of value up to the Olympics. While winning medals is the icing on the cake for an athelete and used as reason for National pride, it cannot and should not be the test of success for athletes. Only very few climb up on the podium but each and every individual needs to be recognized and honoured for just being there. Personal best is still the fairest measure to success. It was predictable that commentators would start to talk of an athelete who is expected to win a gold medal and ends up winning a silver or bronze as "failing". This kind of talk grates on me. We all know that in any particular day in a high calibre competition any one of a number of contestants can win. Even the most outstanding athelete can do his or her best on that day and another athlete can score higher. This is not a failure but an accomplishment and we should recognize it as such rather than make an athlete feel they have failed , themselves, their team mates, their country. I was prepared for this and have put up with the broadcasting nonsense. This is not what has left me uneasy about the Olympics. It took me a while to sort it out. It began with the opening ceremony which lead me to look at the Canadian athletes as a group. I thought the opening ceremony was a visually interesting presentation. I gather it was an attempt to display who Canadians are, their values and how they feel about our magnificent country. It failed. Canada is officially a bilingual and multi-cultural country. This differentiates us from our sounthern neighbour. When you examine the Opening Ceremony you realize there is very little French spoken or French speaking entertainers making a contibution. Even the official statement by Mr. John Furlong ,the head of the committee that organized the Winter Olympics was only done in English. It was nice that the local First Nations' people were highlighted. And so they should be. The First Nation's people of British Columbia never ceded their territory in treaties as occured in most of Canada. Only in recent years have substantial settlements been made with First Nation's communities in British Columbia . They have regained some sovereignty over their traditional territories and there is an increasing appreciation of the uniqueness of their customs and culture. There is a lot more to be accomplished in the area of how Canada treats First Nation's people. Our historic record is quite shameful. Canada is still one of four countries (Canada, United States , New Zealand and Australia) which has failed to sign the UN Declaration of the Rights of Indigenous People, a small but symbolic jesture of some importance. With the exception of the First Nation's presence in the Opening Ceremony there is little recognition of the ethnic and cultural mix of Canada. Vancouver is one of the most ethically diverse cities with very large Asian populations. Where were the Asian faces in the celebration of the Winter Olympics? Where are the faces of all the identifiable minories in Canada. From the Opening Ceremony you would get the impression that Canada is still an English dominated country which tolerates some French. This is not Canada of the 21st Century. This is the Canada of two or more generations ago. They should have celebrated Canada and Canadians are they are now in the beginning of the 21st Century. How did they get it so wrong? After I sorted this out for myself I discovered that my view is more widely shared. The Heritage Minister, John Moore and the Premier of Quebec, Jean Charest, among others complained at the absence of French. And apprently, the Vancouver Olympic Committee (VANOC) rightfully heard from the local ethic organizations about the absence of visible minorites. I gather they are scrabbling to make some changes at the last moment in the closing ceremony to limit this criticism. What is distressing is that early on the Committee had heard these concerns and put together the programs largely ignoring them. Again, how could they get it so wrong? Finally, I look at the athletes themselves. We need to examine out support of athletes and athletics and make sure that all ethnic communities have access to sport. From the faces of Canada's athletes, with the exception of a handful you would think Canada had very few visible minorites. I hope that this is just a lag in minority communities getting involved in Canadian Winter sports and not some de facto racism within Canada. We need to examine ourselves over this so that by the time another Winter Olympics comes around Canada will field athletes from more of our ethnic communities. I hope everyone is enjoying the Olympics and appreciating the efforts of all athletes. My grandson, Dylan, has come to the end of the portion of his time in Vancouver. He is now on his way to the interior of BC to Osoyoo, in the Okanagan Valley, to spend some time at a resort there getting in some snowboarding and hot tubbing, (these seem to be the to things that interest him the most. Here is a video of Baldy Mountain in the Okanagan region. I think it is this resort he will be at. I have been distracted this weekend, not by the love and romance of Valentine's Day but by the events of the Olympics in Vancouver. Romance will have to wait a week as my friend L is in England at the moment. We have plans for my birthday, next week. I try not to be distracted by the Olympics but they do have a way to drawing you in. I have the added feature of following my grandson. 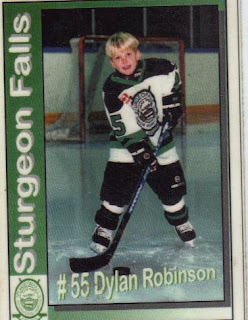 Dylan's blog about his trip to Vancouver to take in some of the activities with his Aunt Di and visit his grandmother. Also, one of his friends from school is in Vancouver to experience the Olympics . I am enjoying his blog as well. A couple of small town boys are having an opportunity to visit a big city and take in an international event. For those who want a little romance, I suggest listening to some of Terry Pendergass music. I remember his romantic R and B music and his striking virile look when I was young. After he was in a car accident and confined to a wheel chair he stopped performing for 20 years. When he returned his romantic sound had not diminished at all. Last Month, he died at age 59. For the romantics among us, of my generation, we shall long remember his songs. For those who like their romantic songs more robust and graphic listen to this tune. It is hard to realize that it is twenty years since Nelson Mandela was released from prison. It is even harder to believe that he was imprisoned for 27 years to be released and be a witness for all of us as the remarkable human being he is. It is hard to imagine how anyone survives such a long imprisonment and maintains their sanity, their humanity; to be released ready to accomplish greatness. 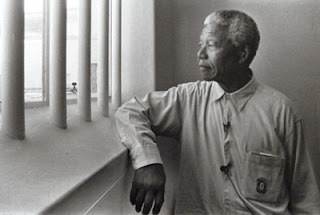 Nelson Mandela in Robben Island Prison, South Africa. This is the poem that inspired and gave Mandela courage to not only survive but to maintain his humanity. finds,and shall find me, unafraid. It is from this poem the recent movie, Invictus, got its name. It is the story of Nelson Mandela, becoming President of South Africa. 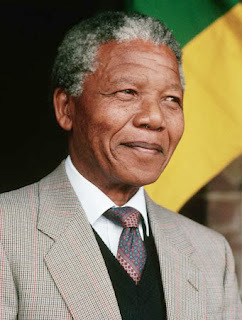 Nelson Mandela, as the head of the African National Congress and first President of a free and democratic South Africa. Mandela was wise enough to know that he should not run for a second term as President of South Africa. For the country to grow strong leadership needed to be shared. While he was seen as the father of the new South Africa, it was greater than any one man. South Africa belonged to all South Africans to make of it whatever greatness they can.Nelson Mandela has continued to inspire all of humanity as a World Statesman of the first order. 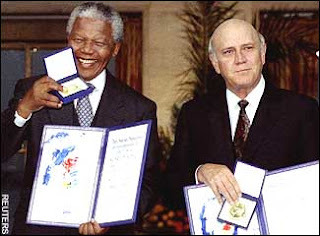 Nelson Mandela and F. W. de Klerk jointly received the Nobel Peace Prize. At first it seemed strange than the oppressed and the oppressors would both be honoured on this occasion. Mandela would not have wanted it any other way for he refused the impulse of revenge and insisted the future belonged to all South Africans. In fairness, F. W. de Klerk had begun the process of ending apartheid before Mandela was released from prison. He was wise enough to have Mandela released without condition knowing he would come to lead the country in the future as the result of a democratically elected government. These two men are an outstanding example of how two peoples of good will can resolve differences and create a new and just future. It takes statesmen of the first rank to hold the vision and lead the way. There were others, white and black South Africans, such as Helen Susman, a courageous South African Jew of Eastern European origin. Wherever their is conflict in the World, we wait for the leadership of great men of humanity of resolve it. I think of Israel and the Palestinians at this time when Israel is in the process of occupying the Palestinians through a system of apartheid. The experience of South Africa proves that such a road to go down ends at a dead end, where a new way must be found with the vision of great men and peoples capable of forgiveness, compassion and understanding. The World awaits men and women of greatness. We shall always remember what Nelson Mandela has accomplished and show us a better way. They are ,indeed, an odd couple. What they really share is a love of napping and just being together. Tiny kitty ( a runt of a cat) seeks out Heidi and Heidi just accepts her being close. Dreaming. . . . . . . . . . . .together. 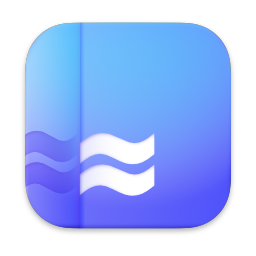 Now in harmony. My oldest grandson, Dylan, age 13, is off to the Winter Olympics, in a few days, to enjoy the atmosphere and be at some of the events. This is a gift from his Aunt Di, who lives in British Columbia. What a great opportunity for him. He will also take some time to do a little snowboarding in the Rockies near where his aunt lives. I am sure he will have a wonderful time and carry memories of this occasion for the rest of his life. My grandchildren have all been active in a number of sports. They all play organized hockey. It turns out that Olivia is the most physical player not afraid to take the boys on her team out of the play with a healthy body check. Much to her father's delight.Olivia and Dylan have also been involved in competative swiming. Dylan has just begun to play football at school.All three children have also played baseball, soccer, volley ball, snowboarding and some sports I have yet to find out about. 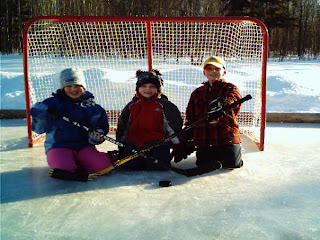 Sport are a big part of their lives with their father being a big fan and still a recreational hockey player. Sports takes up a lot of the whole family's time and energy. It is not all sports. The grandchildren are all excellent students in school, often at the top of their class. They attend a school where instruction is in French, a second language they have learned. 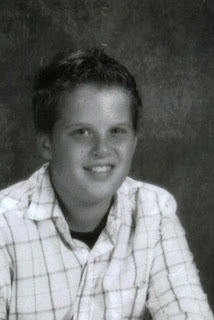 They also play musical instuments, Dylan plays a keyboard and has a set of drums. Olivia also play keyboard a little. I am not sure what Travis plays. I do know he took step dancing lessons one years. This is very popular in the French community, with our local Fiddle and Step Dancing Festival in the summer. Dylan aspires to become a veterinarian. He is always interested in the animals around my place and seem to be the most interested in Heidi.